Get everything you need for your next candlelight vigil right here, the candles and the protective bobeches that keep the wax off your hands. Our vigil candles are 5 1/4 inches long by 5/8 inches in diameter. The bobeches are made out of a thick card stock making them very sturdy. 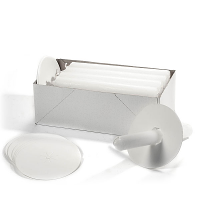 These white drip protectors will work with any taper upto 7/8 inches in diameter. 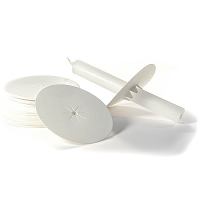 They are perfect for church services, candlelight vigils, or any other ceremony where hand-held candles will be used.